This 3 BR, 3 Bath is located minutes from all Branson attractions and Silver Dollar City. 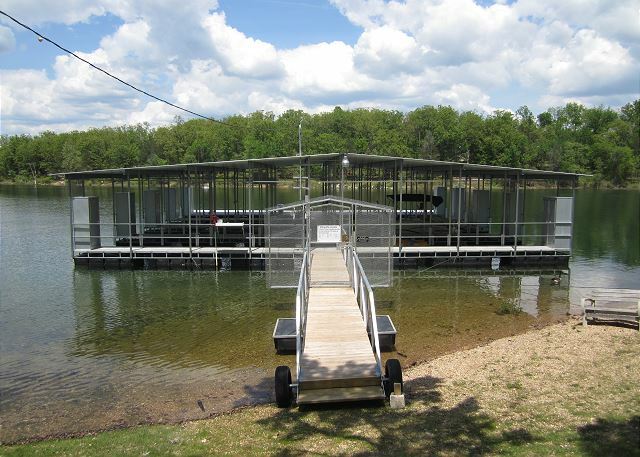 Next to the Table Rock State Park for all water activities and also has access to a 11 x 30' slip dock at Vickery Resort for your boat. Enjoy the swim platform, or the outside pool for swimming. A large gathering area available for large groups to enjoy together. Lakeside and quiet, one mile south of Table Rock Dam and the Visitor Center, Fish Hatchery and Lake Taneycomo. This was are second stay at this unit. Found it to be in as good as shape as when we were here a year ago. Location of resort is convenient to lake and branson attraction but out of the congestion of in town options. Staff pleasant to work with. Unit itself is well appointed. Do need to bring own napkins and paper towels. Closed in porch area is nice addition in the cool days of october. The condo we stayed in was very clean,appliances up to date,all essentials provided. Management was great,took time to explain things and patient with questions. Condo great location, beautiful lake view and quite setting. Would recommend this resort to anyone. Great time! Everything we wanted for a Family Vacation! This condo was everything we were desiring for our family vacation! Family of 9 (5 adults, 2 elementary age grandkids and 2 toddlers) had plenty of room with the 3 BR and 3 Baths. The glassed-in sunroom was the perfect place for morning coffee and meals--beautiful view while staying cool! Condo was exactly as pictured ~~ very clean, well organized, kitchen had everything we needed for cooking and the furniture was comfortable. 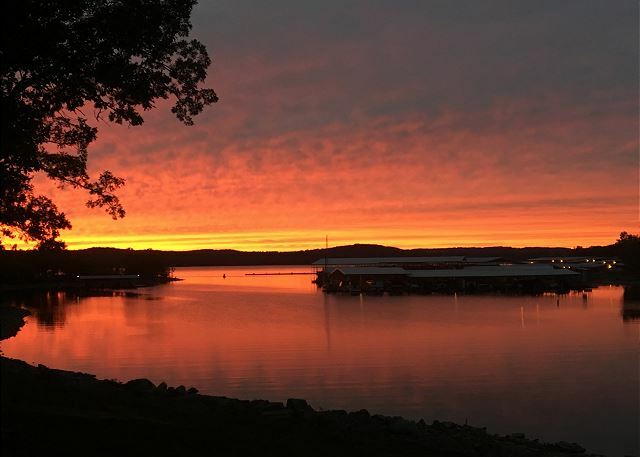 Besides easy access to Branson for evening meals out and entertainment, Vickery Resort provided our most enjoyable experience of 2 outings on the available pontoons. We all loved the relaxing time on the lake, complete with picnic lunches, swimming off the pontoon and jumping off nearby "cliffs". Management was very friendly, helpful and always ready to assist with any questions. We would love to spend family time here again! Absolutely beautiful. It was definitely a peaceful hideaway. We will be staying again! Everything as described. Condo was well furnished. Location made it easy to get to lake activities as well as Branson attractions. Nice place. Added sun room on deck area a favorite place to be in the mornings. WE have been to Branson several times, but have never stayed on the lake. After my daughter did extensive research on the perfect place for a full family vacation, we chose Vickery. The location description was accurate and convenient with easy access to either end of 76 where many of the attractions are. The resort and our condo was very clean and well-maintained. The owners were amazing--so nice and courteous, which is important when a stay lasts a week. I would recommend this resort to anybody who wants easy access to the lake and to Branson itself. We had a wonderful time and would be very happy to stay there again. Beautiful condo, very well maintained and close to the water with a great view. Loved the glassed in patio. Colleen is awesome to work with and we can't wait to come back next year. Another great vacation at Vickery Resort! We love it here! Have stayed here the last 3 summers, last 2 in unit B2. It is a wonderful unit with lots of room for the whole family! Has a great view and walk out to the dock! Grandkids love swimming and fishing off the dock. Nice quiet cove. Lovely condo in a great location. Great for large families. Fantastic! We loved our stay at Vickery Resort! This condo is wonderful. We loved the open floor plan with the glassed in area off the living room. There is plenty of room for the family. The 3 bathrooms was very helpful with our family. We liked being able to walk off the deck to get to our boat on the dock. Colleen is very friendly and always available to assist you with any of your needs. We will return to Vickery Resort and will request this unit! This property was perfect for our needs. I've stayed many places on Tablerock and will return to this one ONLY. Staff super friendly and helpful and felt at home instantly. The walkout to lake worked out great as we had small children (4 and 1) and there was a gate on the outside deck! The glassed in area was utilized EVERY day. I'm so glad to have found this property. Already planning our next trip back!! The whole family absolutely loved staying at Vickery Resort and will definitely be back. The condo was very clean, everything looked brand new and stylish, and it was huge! The owners of Vickery Resort were extremely kind and helpful. We enjoyed the lake, taking out the paddle boats and playing on the waterpad, and also playing in the pool. Fantastic trip! Just wished we would have stayed longer than 2 nights! Vickery Resort is a super place. This 3 bedroom 3 bath is perfect. The glass enclosure on the living room is really nice and the view of the lake and dock is so enjoyable. We were at Vickery Resort for a family reunion and everyone loved their accommodations. We are already planning our next vacation to come here again and Colleen is the greatest to work with.